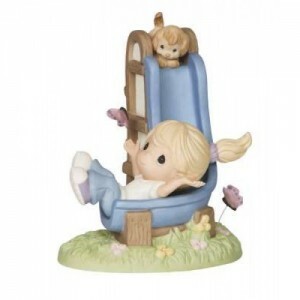 The first Precious Moments figurines were produced in 1978. The original 21 pieces were produced were the inspiration of artist Samuel Butcher. They were an instant success capturing the charm and feeling of Sam’s pictures.Sam named them Precious Moments because they carried messages of messages of love, caring and sharing. There have now been over 1,000 of the porcelain bisque figurines. Many of the first actual figurines were sculpted in Japan by the amazing Yasuhei Fujioka. The original drawings are still sent to Precious Moments Design Studio in Japan.Each year several pieces retire and new ones enter the range. There is a growing secondary market and a busy collectors club and an incredible visitors center. Sam Butcher started as a minister and since his career has had a strong religious and spiritual influence. He created and designed the Chapel as a tribute to the Lord. It now forms the foundation of a 1,500 acre complex including a gallery museum, the Fountain of Angels (120 bronzed angels, three stories tall), shops hotels and convention arenas. A very popular destination for Precious Moments collectors. The Chapel also has exclusive Precious Moments figurines. The Precious Moments Collectors Club provides news and information about Sam Butcher and news, information and pictures of the Precious Moments collection in the quarterly Good News Letter. Members also receive a joining gift and the opportunity to purchase exclusive figurines. For 2015 the Members only figurine is Your Friendship Brings Joy To My Life. The two members only figurines include: just a little note to say you brighten my day and good friends are so uplifting.